Article: As anti-science deniers of the global warming pause, i.e. hiatus, keep denying its existence, actual climate scientists keep trying to understand its source - and the new Indian Ocean 'cause' adds to an ever-expanding list of 'pause' science research. Besides the current crop of IPCC climate models failing due to their being CO2-centric, the models also suffer failure from the thousands of sub-simulations they are required to perform. It is known that there exists a major asymmetry of the El Niños versus the La Niñas. If climate models can't accurately simulate this asymmetric relationship it makes for poor global climate predictions. Scientists published a recent study to determine the success of modeling the ENSO asymmetry - the results were not encouraging. ===> "With respect to their findings, Zhang and Sun report the following: (1) "the underestimate of observed positive ENSO asymmetry measured by skewness is still a common problem in CMIP5 coupled models," (2) "all the models are also found to have a weaker ENSO asymmetry than observations," (3) "CMIP5 coupled models have a significant cold bias in the mean sea surface temperature," (4-6) "biases in zonal wind stress, precipitation and subsurface temperatures ... are also too symmetrical with respect to ENSO phases," (7) "sea surface temperature warm anomalies over the far eastern Pacific are found to be weaker in the coupled models than in observations," (8) "most models also have a weaker subsurface temperature warm anomaly over the eastern Pacific," (9) "most models have a weaker precipitation asymmetry over the eastern Pacific," (10) "most AMIP models have a stronger time-mean zonal wind over the equatorial central and eastern Pacific," and (11) they "underestimate the observed positive skewness of zonal winds in the central Pacific."" Conclusion: The multi-billion $$ climate models have proven time and again that they are incapable of predicting future climate with any level of accuracy. Policymakers would be best served by completely ignoring the computer simulations as they poorly match the empirical observations of the global and regional climates. However, the models still hold value for the researchers, but that is their only benefit. 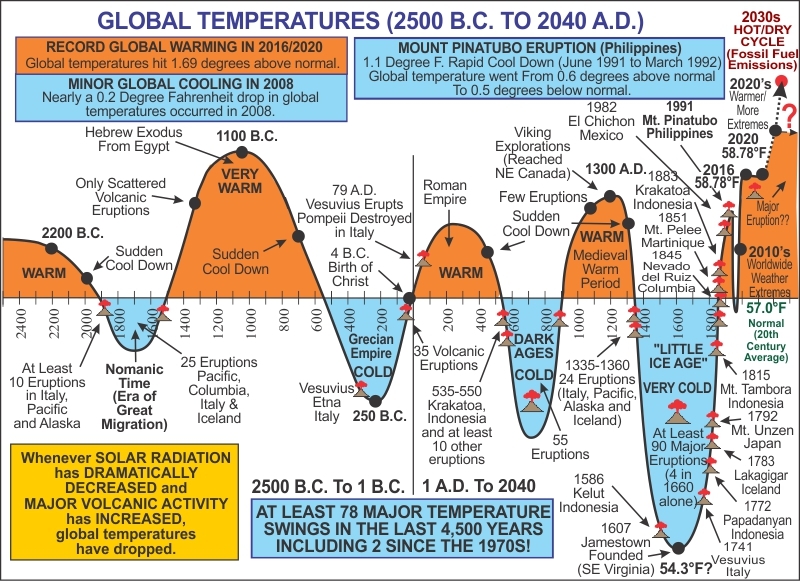 Previous climate articles and charts.